This may surprise you, but this city is one of my favorite places to be in the summer. I love the energy that comes with the heat, the lazy evenings spent at rooftop bars and relaxing in the parks with friends. Although the temperature on the underground can get unbareable, London is a great place to be when the sun is out and is the perfect place to spend the weekend during the summer months. Whether you're packing a bag for a weekend visit, or already live in the city and are enjoying a couple of days away from the office, it's important that us guys stay cool whilst maintaining that classic style. 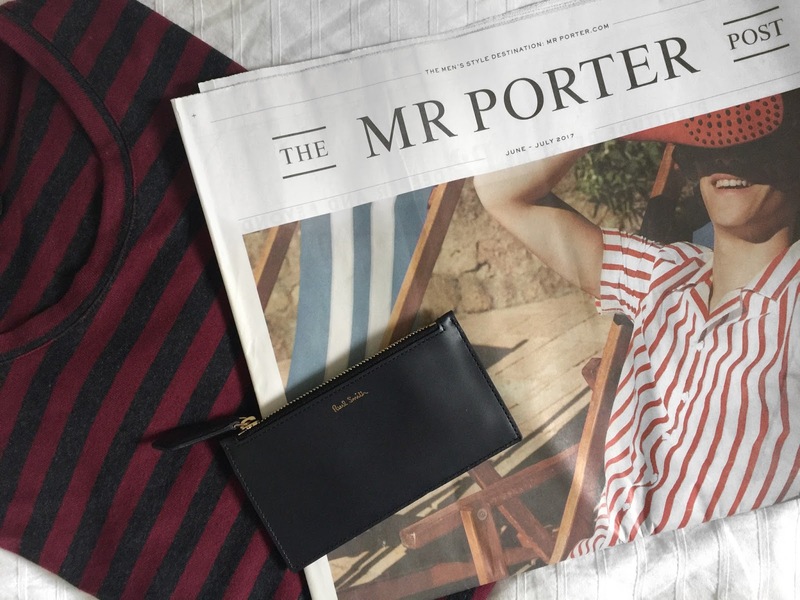 For me there's only one place to go when I need a wardrobe revamp or some style inspiration - Mr Porter. They have so many amazing pieces, and have compiled a Summer Shop to help us guys stay kitted out this season. SATURDAY: I decided to wear this striped tee and denim combo. The tee is by A.P.C and is a great alternative to the usual navy and white stripe that I tend to to go for. I partnered it with these cropped jeans and denim jacket for that laid back, casual vibe. The lighter tones and cropped length make this look perfect for the warmer weather and a relaxed day in the city. The optional layer of the denim jacket makes an easy transition between day and night, as you enjoy a few more drinks with friends outside after the sun goes down. SUNDAY: Some people use Sunday as a day of rest, but I like to dress a tad smarter and head out for lunch before putting my feet up back at home. I went for this white polo and chino combination, again in cool colours. The slim chino's are by Hugo Boss and felt great on. They sit quite low on the hip, something I don't always go for, but ended up really liking. 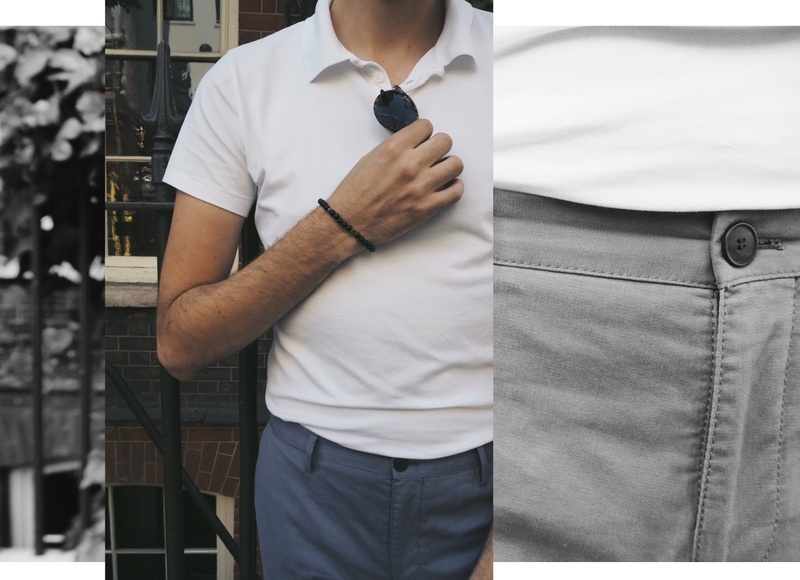 I rolled them once at the ankle and tucked in this white polo from A.P.C. The clean lines and simplicity of this outfit make it perfect for Sunday lunch - on this occasion at Dean Street Townhouse (One of my favorite spots). I usually don't carry a wallet as I find them too bulky to take around in my pocket, so this ultra slim Paul Smith zip-up wallet solved the problem. The minimal branding and sleek design make it the perfect accessory for us gents. It has a number of card slots on the back, with a zip-able internal compartment for notes or a handful of coins. It's made from a great sturdy leather which'll stop it from creasing over time. I also think you can't be without a trusty pair of sunglasses, and if watches aren't your thing, then go for one of these beaded bracelets by Mikia.